Feather Concho Custom Leather Desk Set shown above in chestnut leather. 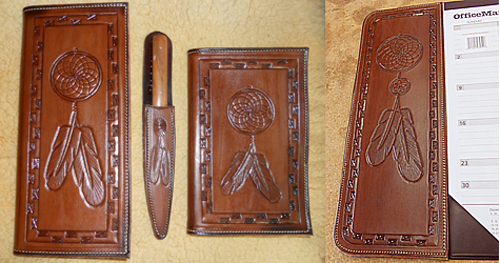 This desk set includes day planner, notebook, desk calendar, and a letter opener with a custom leather sheath. You may choose any of our designs, leather colors, and accessories to create your own one-of-a-kind leather desk set. Ranch Brand Personalized Leather Desk Set shown above in russet leather. This desk set includes day planner, portfolio, mouse pad, and six custom leather coasters. You may choose any of our designs, leather colors, and accessories to create your own one-of-a-kind leather desk set.